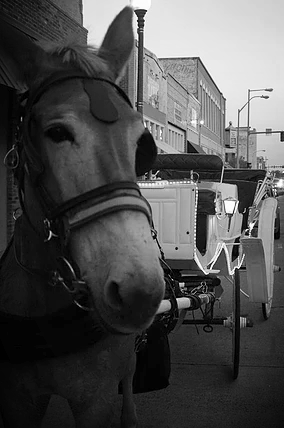 We are a full service carriage company offering mule-drawn carriage tours, wedding rides, and service for special events. We are locally owned and operated, with a 15 year history in the downtown Lake Charles area. From the beginning with one mule and one carriage as J.R. Carriages to offering a fleet of carriages and ride options today as Lake Charles Carriages, our focus has been and continues to be on providing the best possible experience to our customers. Fri - Sun: Times good only when carriages are at the Sea Wall or by Reservation. *We may be available to accommodate special reservations outside of normal operating dates and hours. CHARPENTIER HISTORIC DISTRICT TOUR - The Charpentier Historic District is on the National Register of Historic Places and covers more than 40 blocks of turn-of-the-century Carpenter-style buildings. This day tour is only offered during Spring and Summer to ensure you get the best view of the historic homes and their beautiful gardens. SHELL BEACH DRIVE TOUR - The Shell Beach Drive Tour is a stunning display of Southern mansions built by powerful and prosperous Timber Barons when Lake Charles was a booming timber town. The district is filled with architecture unique to Lake Charles; as the Timber Barons tried to outdo each other, they created some of the most outstanding design details. We provide a guided street view tour of these homes along the lake shore. HISTORIC DOWNTOWN LAKE CHARLES - The Historic Downtown Tour brings the past to life. The Public Square area has been the hub of government for the city and parish for over a hundred years. The Courthouse, Historic City Hall, and the Cathedral were constructed immediately following the Great Fire of 1910, which leveled most of downtown. Did you know that Lake Charles had a brothel? I mean a Taxi House. On the tour, you will hear all about that little secret and more. If history isn't your forte, this may be just what you need. Take a quiet ride on Downtown Ryan Street, Shell Beach Drive, or meander around Bord Du Lac Drive. The Christmas season is one of the best times for a scenic ride. Come tour Shell Beach Drive and be amazed at the spectacular display of lights. Throughout the year, the mansions are quite a sight, however, you will not want to miss these homes light up with a display of Christmas cheer. Lake Charles Carriages offers a unique style of transportation for your special event. We offer 6, 8, and 12 passenger carriages ready to transport you through Downtown Lake Charles. Our entire fleet can accommodate up to 75 people! Perfect for engagements, anniversaries, birthdays, and reunions! We also provide transportation for parades. Event not downtown? No problem! Our carriages are available for travel within fifty miles. Lake Charles Carriages can make your dreams come true! It's your big day, let us make it even bigger. You’ve spent enough time planning, allow us to arrange for you to arrive in style. We offer a unique way to sit back, relax, and enjoy your wedding day. Our elegant vis-a-vis carriages and professionally trained staff will ensure that you arrive on time. These carriages are also ready for travel! We'll bring flair and sophistication to your venue. Don’t forget about your wedding party! Lake Charles Carriages can accommodate them, too! All pricing based on 6 passenger vis-a-vis carriage. Larger carriages available by reservation. This ride will take you down Bor du Lac Drive in front of Millennium Park and back. Only available on weekends when carriages are at the seawall. Our Seawall Ride takes you on a scenic lakeside jaunt. The ride will take you in front of Millennium Park, the Amphitheater, and Veteran's Memorial Park while taking in the beautiful Prien Lake. Only available on weekends when carriages are at the seawall. Ride begins on Bor du Lac Drive and meanders down Shell Beach Drive to the Historic Gray Estate. Ride begins on Bor du Lac Drive and meanders down Shell Beach Drive to Lake St.
ONLY Available during the Christmas Season* Ride takes you to see the Christmas lights on Shell Beach Drive and the 12 Days of Christmas lights at the Lake Charles Civic Center. To schedule your Christmas Light Ride online, please click on the link below.